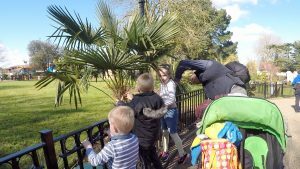 On Friday the 25th March we were going to go to Alton Towers, but decided last minute to go to Chessington World Of Adventures. We have been to this park a few times and we love it. It has a wide variety of attractions so the whole family has something to do. Today was Good Friday so we were expecting it to be busy!! We started off early to make the long drive down. We let the tiddlies have their iPads in the car today, which we wouldn’t normally do – mainly because of not having anywhere to store them once we are there and not liking leaving them in the car. However, as we had been out yesterday and spent a long time in the car we thought we would allow it. Well, Reuben started to feel sick almost straight away and Grace not long after and we can only put it down to the iPads, as once they turned them off they started to feel a little better. It wasn’t the best journey we have had. We arrived 10 minutes before opening and the queue in the car parks was huge. We have never seen the queue to get in this big before. The parking attendants seemed to be struggling to keep order when parking the cars which could have been the reason to why it was so slow getting in. We could already tell it was going to be very very busy. We made our way with the rest of the crowds to the Explorer Gate entrance and went through the annual pass entrance which is all the way over to the right, so if you have one don’t queue with the crowds make your way round to the right and you get in really fast. First problem of the day was they didn’t have any maps. We have been a few times but Chessington is so hard to navigate around, even with a map so I didn’t hold up much hope without one. We stopped to have a look at the ride times and we had planned to go straight to the Vampire ride, but it was already showing 80 mins – so that was a big fat no. Even though we were some of the first people in the park they allow hotel guests in an hour before opening so the queue was clearly a back log from them (as previous hotel guests, we have also experienced this). So we took a left instead and went to Kobra which was showing 5 mins, Only Grace is tall enough for this, so Adam took her on. They had only been in the queue for 5 mins when the queue time jumped to 60 mins gggrrrrr. They were actually on there for almost 45 mins in the end. This is highly annoying when I had three boys running round like fruit loops after being trapped in the car for two hours. I decided to take them for a little walk around Lorikeet Lagoon, which is a walk through attraction (no pushchairs allowed) with lots of beautiful birds flying around you. You are also able to buy nectar to feed them with. We didn’t which I’m pleased about, as when we were walking (running after Seth) round — the people that had the Nectar weren’t getting any interest from the birds at all. The staff were struggling to get them to feed as well, so it would have been a waste of money. We did have some close encounters though, as the birds fly really low and are not really scared of humans at all. There is also a really nice pool in there with huge fish. This was Elijah and Seth’s favourite thing — so far. When we got out Adam and Grace were just boarding so we stood and waved like crazy people hoping to get their attention which we did — yay. There was crowds of people around and I think this was because this is the closest area to the Explorer Gate entrance, so most people gravitate towards it. Once we started walking away from the area the crowds thinned out and it wasn’t so intense. We made our way to bubble works, as this is a brilliant family ride that we can all go on. Although, we have to go in separate boats as it’s only 5 to a boat. The queue line was showing 45 minutes but as we have been on it before, we knew that it never takes this long. It is a really fast loading ride and we waited less than 20 minutes. The ride (If you haven’t been on it) is a little boat ride. The boats are similar to the rapids and take you on a nice little journey through a bubble factory with a surprise at the end. You get a little wet on this, but not wet enough to avoid it though. The ride leads out into a shop — of course, but the merchandise in here is really cute and you can get a ride photo as well to remember your ride with. It was nearly 12 at this point. The day was flying by so we decide to get a little bite to eat. We had some hot dogs and me and Adam had a coffee. It was really nice but the service was really poor. They were clearly training new staff and neither of them really knew what they were doing and the queue got really long behind me. They were polite though, so I couldn’t really moan to much. 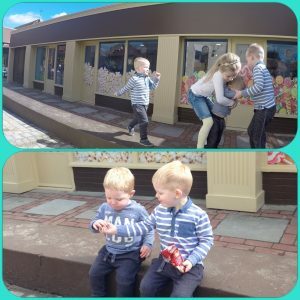 I had bought a few snacks with us so we stayed sat down in the sun while the tiddlies played on a wall and ate their way through crisps and biscuits as well as the hot dogs — greedy monkeys. It was a really nice warm day. While we were sat there we could hear a few people complaining about attractions being closed and the queue times being so long. Im not really sure what happened this day, but the park was just to busy and it seemed like rides kept closing down and I couldn’t really blame people for complaining. If we had paid full entrance price for one day and were not able to barely do anything we would be moaning too. This is another reason why we love the Merlin Annual Passes, as it doesn’t bother us to much if we can’t get anything done. 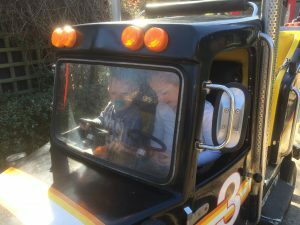 We had a slow walk around and decided to go on Tiny Truckers, which is a mini truck ride that the kids can sit in and pretend to drive while the adults sit on the back. I think it’s really rubbish, but the tiddlies absolutely love it and think its brilliant. The ride was advertised as a 45 minute wait, an it was at least a 45 minute wait before we eventually got on. They do have an interactive queue so there are things for the little ones to do while they are waiting, but still 45 minutes to go on small trucks for less than 3 mins. While we were waiting we heard more people moaning that they had tried to buy fast passes for all the rides and it was £70 extra on top of park entry to do this. This is crazy expensive on top of entry as well and we wouldn’t pay for that at all. I started to feel really sorry for all the families, as you could see more and more of them were getting really annoyed as the day went on. I had had enough at this point, as the park was just to busy. All the queues were too long and it was now after 1 o’clock, so we decided to call it a day for the rides and go and enjoy the animals. You have lots of different enclosures to walk around. 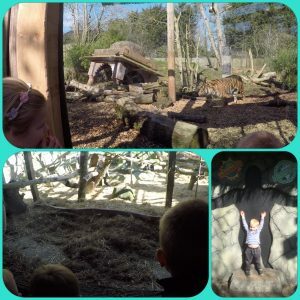 We went to Trail Of The Kings, where you have Lions (they weren’t there), Tigers (we had a brilliant close up view of one), Gorillas (we got a great place by the glass, and the tiddlies stayed there for a good 10 mins). There is not loads of animals in this bit but they have really good viewing areas of the animals there. As we were leaving this area, I heard a father shouting at his son and give him a right wallop over the head just after we had walked away from them. I looked at Grace and asked if she knew what had happened and it turned out that the little boy had punched Grace in the back for no reason what so ever. The father must have seen him and decide to hit him as punishment, as Adam witnessed him clipping him around the back of his head. We checked Grace, but there was no mark and she wasn’t really bothered or upset at all — so on we went. We went and saw the penguins, which is Reuben’s favourite. He would sit there all day if he could, and we did spend a good 20 minutes just watching them. Seth hadn’t had a sleep at this point so we saw a really good opportunity to make a move and leave so he would sleep all the way home in the car and not get to upset as he gets a little stressed strapped in the car for to long (which is annoying as the rest travel really well). It took us another 30 mins just to find the exit lol as it really is like a maze in that park, the crowds were really bad now and everyone sounded angry. 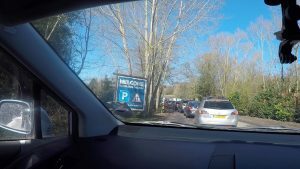 When we got to the car park all of them were full to capacity and they had parked cars on the roads that you drive in and out of we have been here about 4-5 times and have never ever seen it this busy even though the last time we came it was summer holidays. Now we understood why the queues were all so long. When we left Vampire had gone up to 140 mins over 2 hours for a ride and people were actually joining the queue knowing this crazy but i guess if your never going back you want to do it all and have no choice but to wait. 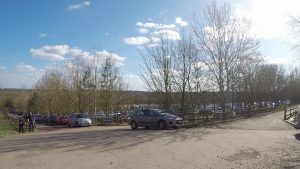 Although the general feeling of the park was a negative feel from the people around us we still had a lovely day, the weather was amazing sunny and warm all day. The tiddlies didn’t notice any of the negatives that we did and just enjoyed being out and about running round and seeing the sights. 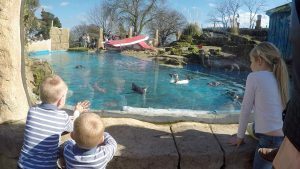 When we asked them if they had a good day all of them said yes (well Seth only did because the others did lol) and recalled there favourite moments of the day as we always do (Reuben’s was the penguins of course). 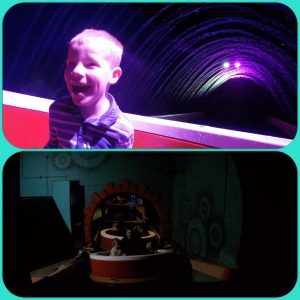 So even if it’s a strained day and you don’t get loads done i don’t think the children notice we never say if we are annoyed at a ride having a long queue we say things like well lets go see this instead or lets get something to eat etc just to distract from any disappointment for them. Chessington really is a wonderful park and definitely worth a visit but if it is busy you are going to struggle to do a lot there. On the way home we stopped at Beaconsfield services (Adam’s favourite for some reason) and grabbed some food for the rest of the drive home Greggs and McDonalds and also a Starbucks of course. Hope this hasn’t put you off Chessington and you have a lovely day there if you have any trips planned for the future.